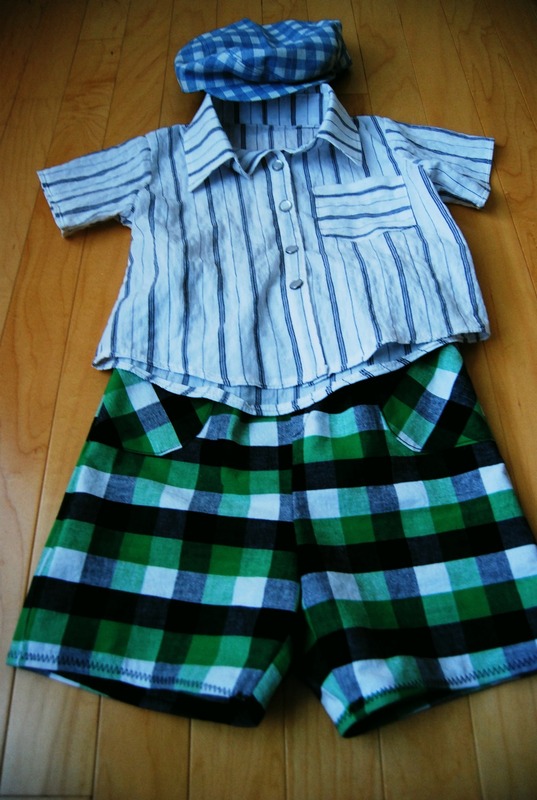 This is a perfect outfit for a little baby newsboy. Well, really it's just the hat that reminds me of Newsies. The rest of the outfit makes me think of a mini hipster. A friend's little one turned one a few weeks ago. I went a little overboard with sewing a gift. I got kind of excited about sewing for a boy. And it gave me an excuse to go fabric shopping. 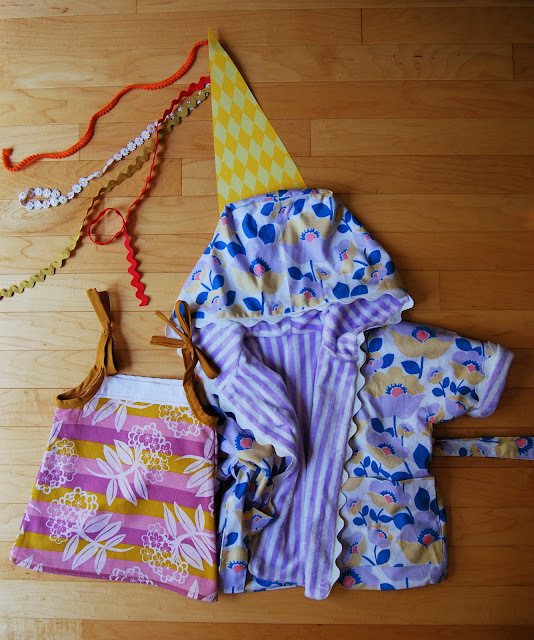 I wandered around the fabric store looking at fabric and patterns and came up with this little ensemble. How much fun I had! What is it about sewing miniature things? I really love it. I knew I wanted to make a button up shirt. That idea was firmly implanted when I went to the store. They were having a McCall's pattern sale so I flipped through the catalog and found this pattern, McCalls 6016. The shirt is put together exactly like a grown man's shirt. I know this because I'm also working on a shirt for J (which is a long, sad post for another day). It had all the same pieces-- just tiny sized. I used a cotton shirting that is super lightweight and kind of pucker-y. It's nice stuff. I opted for pearl snaps instead of buttons. Call me crazy, but I LOVED attaching the snaps. Something about combining sewing and a hammer is super fun. I am definitely planning on making myself something with pearl snaps in the future. I used a block of wood instead of a wooden spool. Does any thread even come on a wooden spool anymore? I found that the hammer alone did not push the snaps together all the way. I took a flat pair of pliers and very carefully squeezed the snaps shut after I had placed them all. On the snaps with the actual "pearl" piece I did not squeeze very hard- just a little around the edges. I'm a little upset with my stripe matching skills, or lack thereof. I thought I had it all planned out. I matched the center stripe on the collar band and collar when cutting. 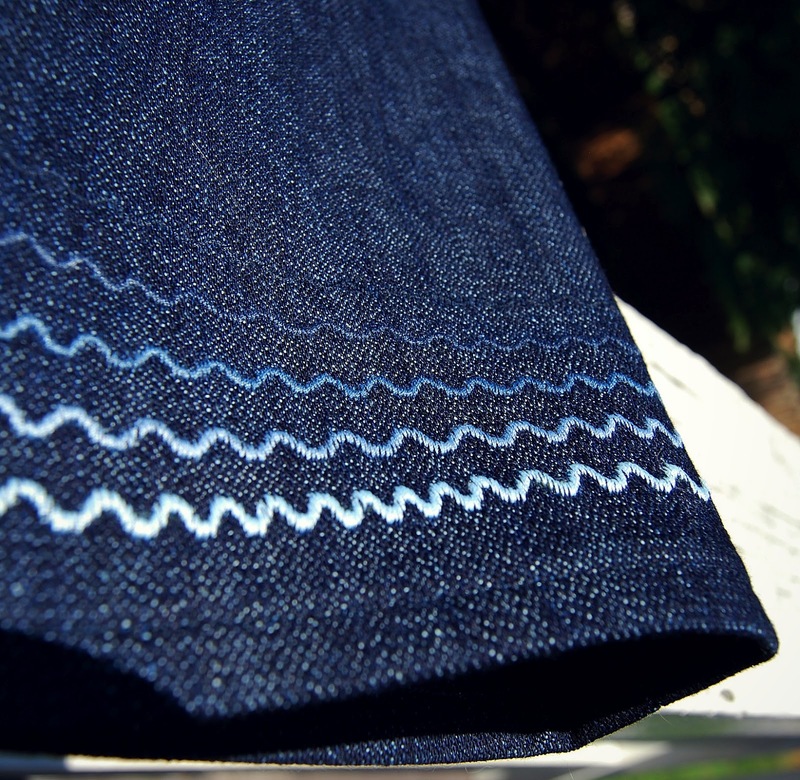 When sewing I matched the stripes beautifully..... on the underside of the collar. I didn't pay a lick of attention to the right side of the collar (which is what shows) nor did I think about the fact that the band needed to match the shirt as well. C'est la vie. Lesson learned- turn stripes to avoid having to match. I momentarily thought about unpicking and attaching a new band but scratched that idea due to lack of time. 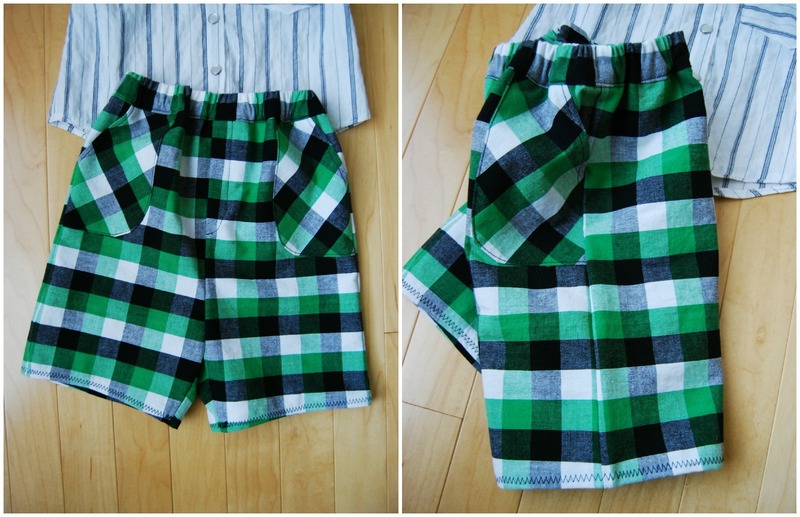 I did a better job of matching the plaid on the shorts. Or man capris, whatever you want to call them. I turned the pocket piece on the bias. I couldn't match the waistband since it was eased on. Any idea why the front and back pieces are flip flopped like that? I mean, the horizontal stripe matches at the center and side seams, so I consider that to be a success. I definitely need more practice matching patterns. It's not my strong suit. That's a little faux stitched fly. Not much to say about them. I liked this pattern, both the shirt and shorts, but the instructions were a little lacking in the finishing department. I did my own finishing. 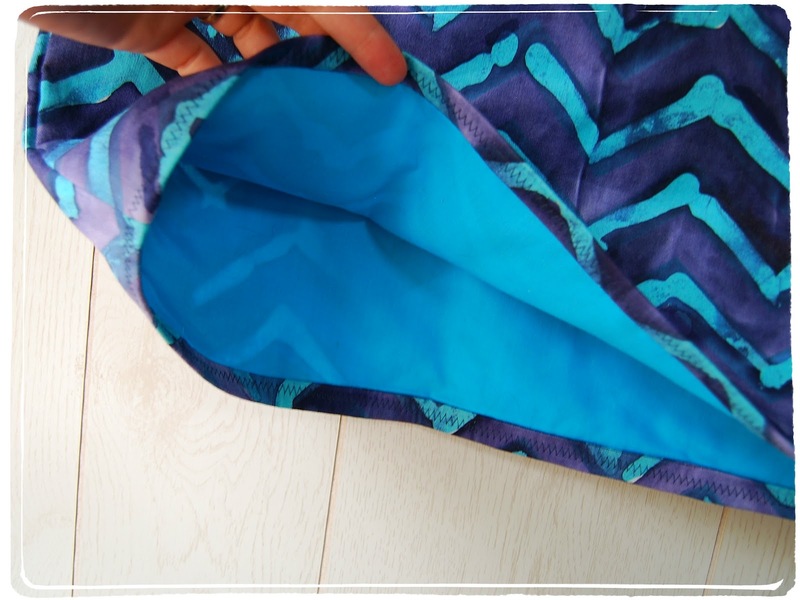 I used my new favorite overlock stitch on my machine for seams I couldn't use a french seam. It all looks very tidy inside, if I do say so myself. And now, the hat. How fun is the hat? I was not able to resist when I spotted the pattern in the catalog, McCalls 6575 (view A). I was very concerned about making the hat because, well, it's a hat. Not something I have a lot of experience making. The pattern is great. Great. It's only three pieces. The instructions are very straightforward and simple. There really is only one major seam you need to sew. But boy is that seam a doozy. Both pieces are very curved and if you have no knowledge of sewing together curves, this would be an extremely difficult pattern. 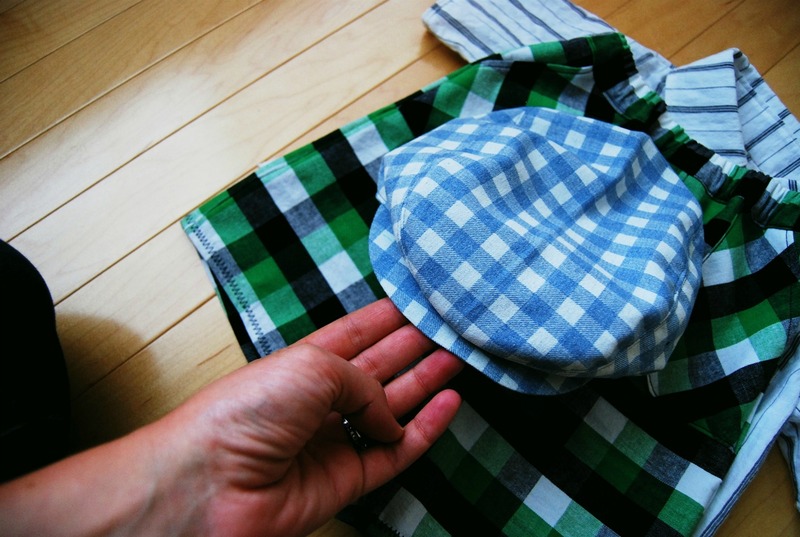 But with a little notching and clipping it all fits together perfectly and makes an extremely adorable newsboy cap. I actually sewed the seam in portions, pinning only one section at a time. It's lined so all the raw edges are tucked inside. Save yourself some trouble by keeping open two places when sewing together the hat and the lining- one on either side of where the back elastic goes. The instructions tell you to only leave one opening but it is nearly impossible to thread elastic in through the casing when you can't pull it out the other side. I ended up unpicking an opening on the other side of the casing and threading the elastic through with a safety pin, like I would any other time. I made an extra large and it fit the little one year old's noggin perfectly. Fun patterns! I recommend them both. I'm ready to make more baby hats. Pretty soon all of my friend's babies will be running around like little paperboys and girls. The most ultimate move in matching: My skirt matches my blog. 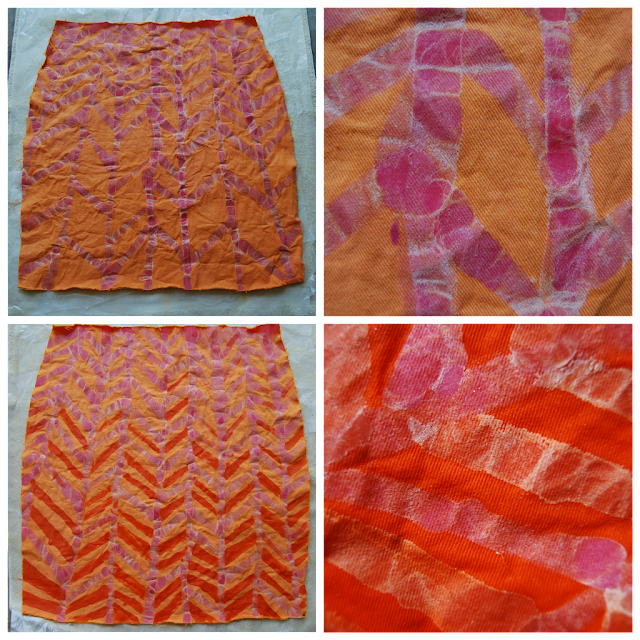 This is my best attempt at a detailed account of how I made this batik skirt. I'm labeling it a tutorial though really it is just a step by step of how I did this. Like I said before, I like to take the simplest approach and do things 'elementary school style'. This is just a documentation of that process, more so I can have a record of what I tried, what worked, and what didn't. I definitely see myself trying out more batik and dye experiments in the future. I was going to start this post on my latest batik adventure talking about how easy the batik process is. It is a simple process BUT it takes some time and forethought. And (this is a big and) you have to have a lot of equipment. Not anything fancy, but many of my kitchen utensils have now been officially categorized as dye equipment. Oops. My first step in the process was dyeing my white cotton bull denim pink. This is where I made my first major mistake. I used a liquid Rit dye (petal pink) because I already had it. Later, I used cold water dyes. The pink Rit dye didn't make it through the very last step and I think I understand why now. 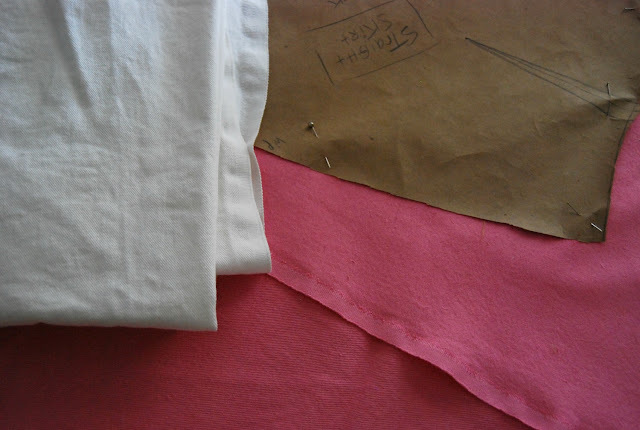 I "rough cut" my pattern pieces from the pink denim. I just wanted to have a general idea of where to place my design on the skirt but I knew I would have to trim to the exact pattern pieces before I sewed up the skirt. I used my straight skirt pattern. Just two pieces to worry about. Here's my set up in the garage. Like I said before, I heat and apply the wax out in the garage. 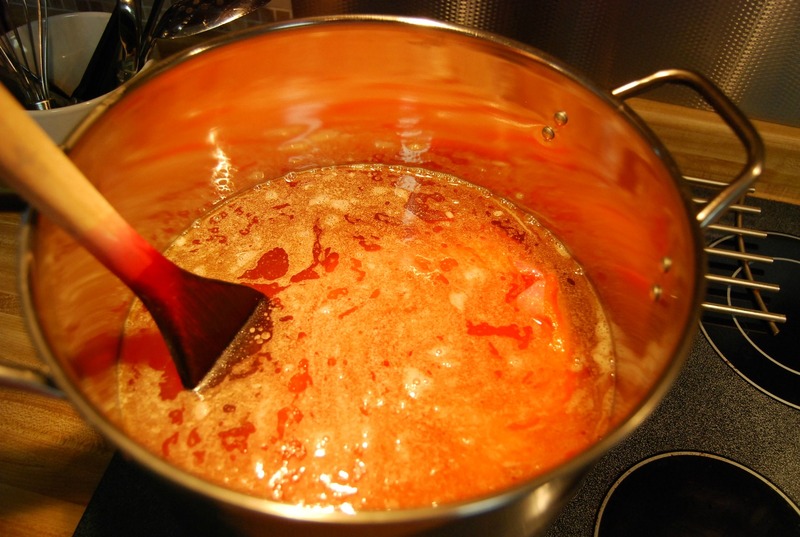 There are some fumes from the hot wax that can be harmful. Plus the smell tends to give me a headache after a while. The wax is a beeswax/paraffin blend. I heat it up in an old rice cooker. Be careful when heating wax!! I like the rice cooker because it melts the wax and then I switch it to 'warm' while I'm working. The melted wax should never get to the point of smoking. I apply the wax with paintbrushes. 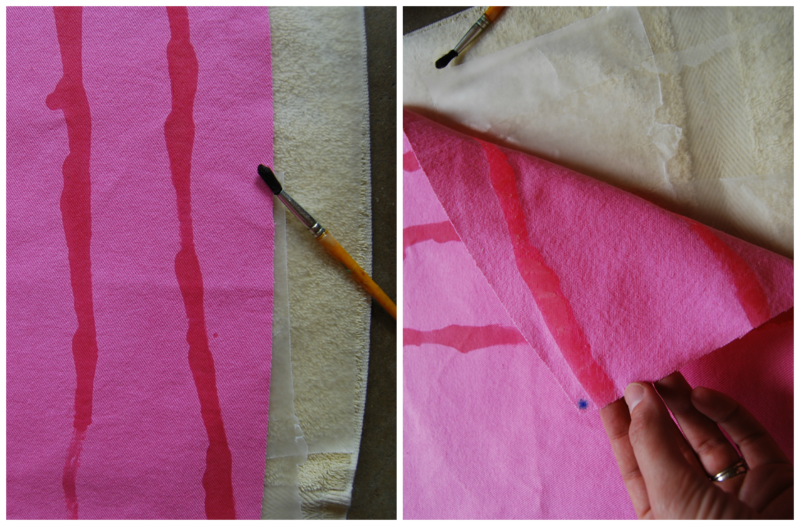 I don't stretch my fabric, just lay it out on wax paper. I didn't draw anything out on the fabric ahead of time but I did have a few sketches to refer to. It's an accident that the design is kind of a zig zag again. I was actually thinking about feathers when I planned it out. Applying the wax with a brush is tedious. You have to keep dipping and working in small brushstrokes. Maybe I'll invest in some actual tjanting tools at some point. The wax has to be hot enough to penetrate the fabric. You can tell that it's penetrated when it looks translucent. 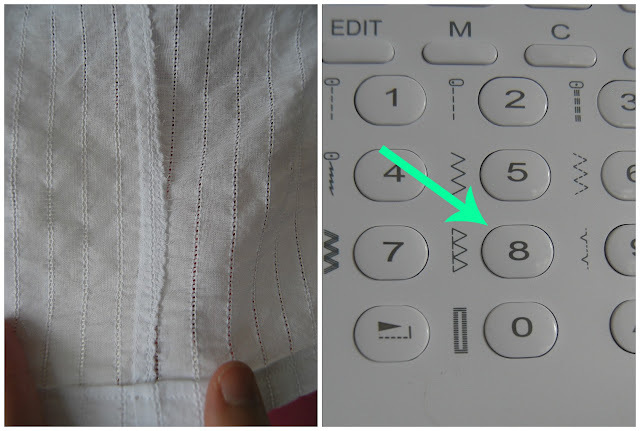 You can also check the back of the fabric later on and connect any places that didn't go through. I put a little blue dot on the front piece with a sharpie to differentiate between the two when I was working. Not that it really mattered since both pieces are pretty similar. After I was done with my first round of wax, I let it cool completely and took it inside to dye it the first color. This is where I felt a like some sort of mad baker. I ordered some Procion fiber reactive dyes which are made to be used in lukewarm water. 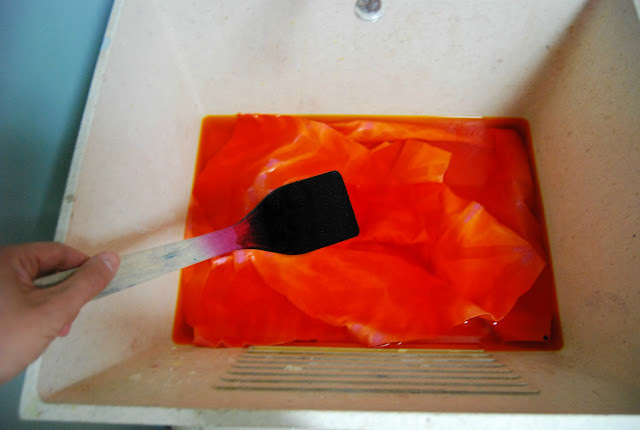 You have to use fiber reactive dyes to tub dye batik fabric because hot water will melt the wax. Makes sense! 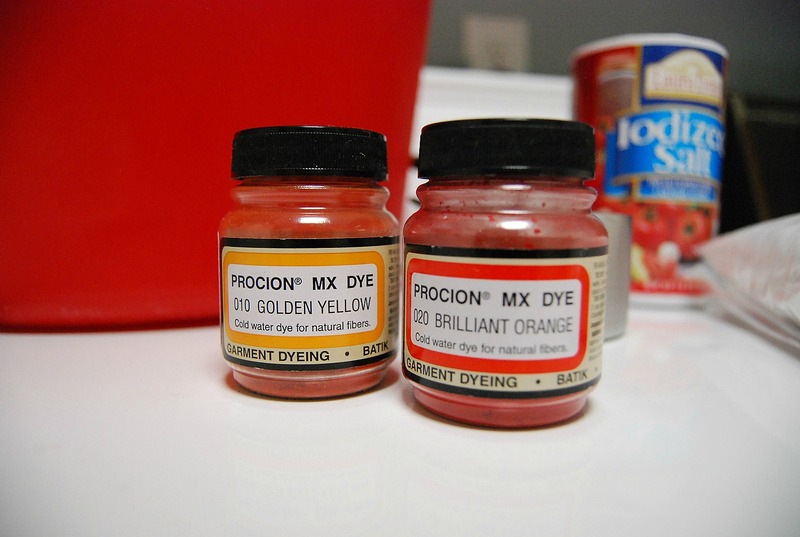 Fiber reactive dyes are fixed using soda ash instead of heat. But I am so tickled with how vibrant and permanent they turned out to be that I don't know if I'll ever mess with hot water dyes again. Seriously. These fiber reactive dyes are awesome. One piece of equipment that was absolutely invaluable was that red bucket. Anytime I had a dirty measuring cup or spoon or anything, I could throw it in the bucket to keep my mess contained. I wore gloves when I rinsed my fabric and I was extremely careful when I measured out the powdered dye and soda ash. It would probably be smart to wear a mask during that step. 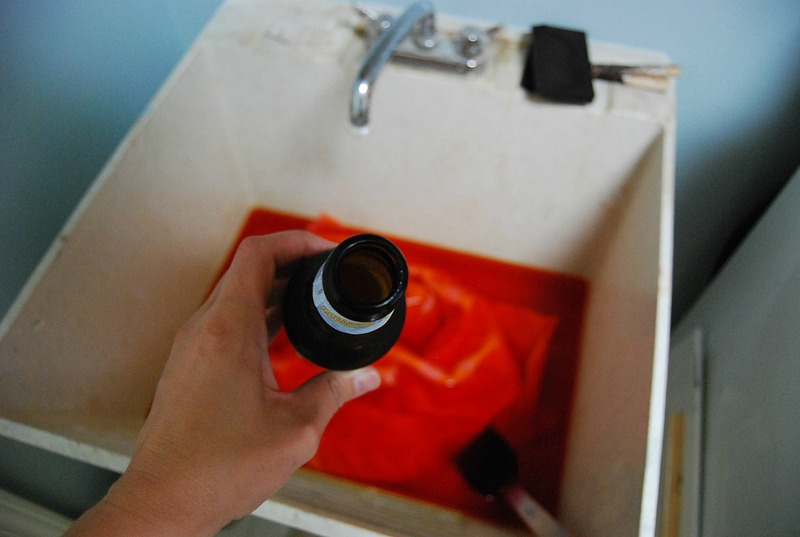 I didn't stick to exact measurement when I mixed up my dye baths because I wasn't concerned with having exact colors. 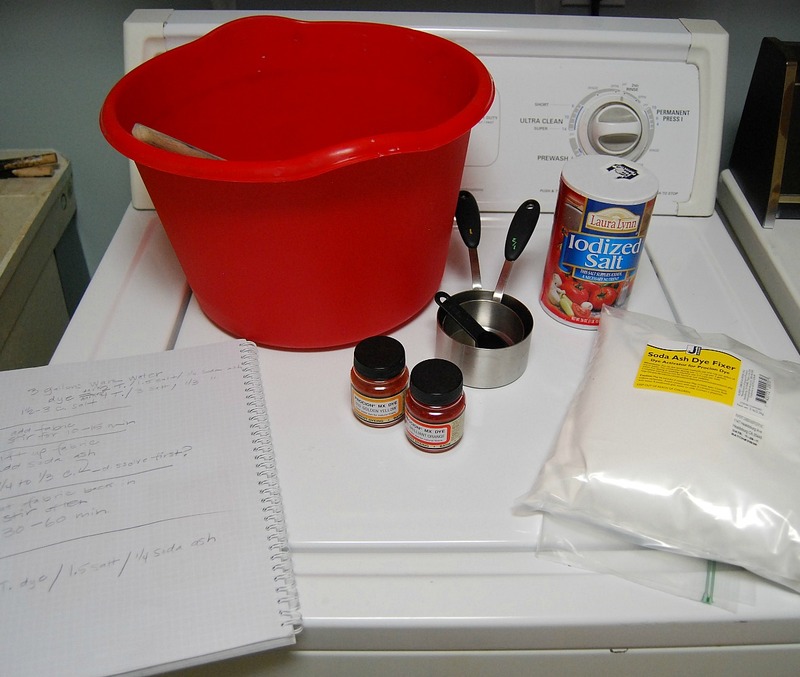 I filled my slop sink with enough water for the fabric to float around freely and then added 1 1/2 cups of salt. I mixed up one tablespoon of dye powder with a little bit of water in a separate container and made a paste to keep it from getting lumpy. Then I added the paste to the water. I used the golden yellow for the first round of dyeing. Next I put in the fabric and stirred it around for about 10 minutes. Then I added a 1/4 cup of soda ash. From what I understand, soda ash makes the dye solution alkaline which is what makes the dye permanently bond to the fibers in your fabric. This is as far as my artist brain got in to the science of it. I just know that the dyes came out brilliantly permanent in the end. Then I stirred the fabric on and off for about 30 minutes. It helps to have a beverage during the step. I rinsed the fabric until the water ran clean, which was not very long. Whenever I rinse fabric after hot water dyeing it seems to take forever for the water to run clear. Not the case with these dyes. I added more wax and tub dyed the fabric again using the brilliant orange. 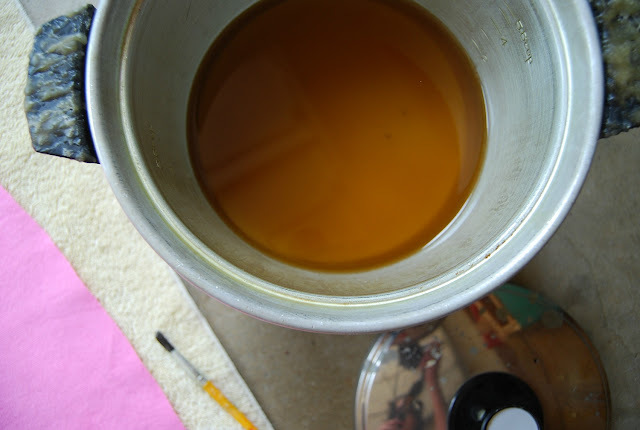 I used the same recipe: enough water for fabric to float around, 1 1/2 cups of salt, 1 T of dye powder made in to a smooth slurry before adding to water and 1/4 of soda ash to fix dye. This collage below shows the fabric after the first round of dyeing (golden yellow) in the top two photos. The bottom left photo is the second round of wax and the bottom right is a close up of the fabric after it was dyed brilliant orange. I was a little worried at that point because I couldn't see the golden yellow underneath the second round of wax lines. The last step, wax removal, is where the pink dye disappeared. There are several ways to remove wax. Before, I used newsprint and an iron. This time I boiled my fabric. I went to Walmart and bought the most gigantic stock pot I could find. I filled it with water and waited forever for it to boil (you know what they say about a watched pot...) Then I put it in the fabric and watched all the wax float up the surface like magic. It was so cool! The melted wax floats to the surface where it stays. You have to keep your fabric below the wax while it cools. 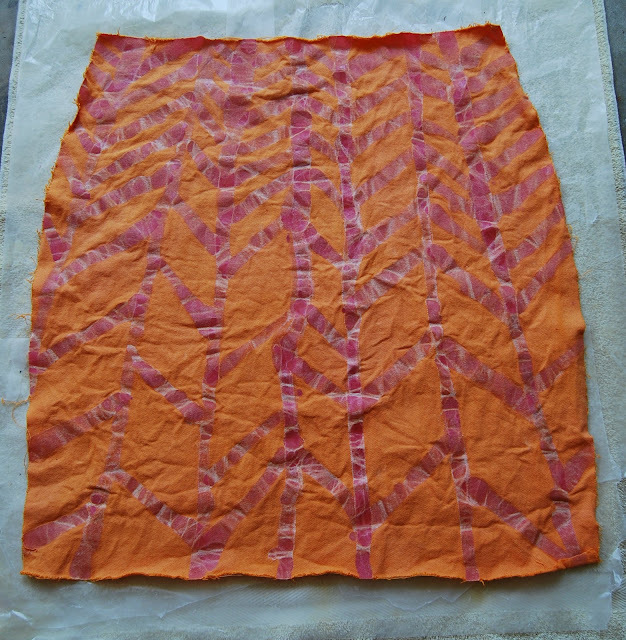 Then you can peel off the layer of wax and take out your beautiful batik fabric. I had to let the pot cool overnight. The best part is that you can reuse the wax you removed from the fabric this way. Waste not, want not. The bad news is that the pink hot water dye I used initially did not survive the boiling. Makes sense. The heat is what supposedly bonds the dye to fiber in a hot water dye, although I've yet to find a hot water dye that is completely permanent. All the pink boiled away and left behind the golden yellow and orange. Pink or no pink, it's still pretty neat imo. 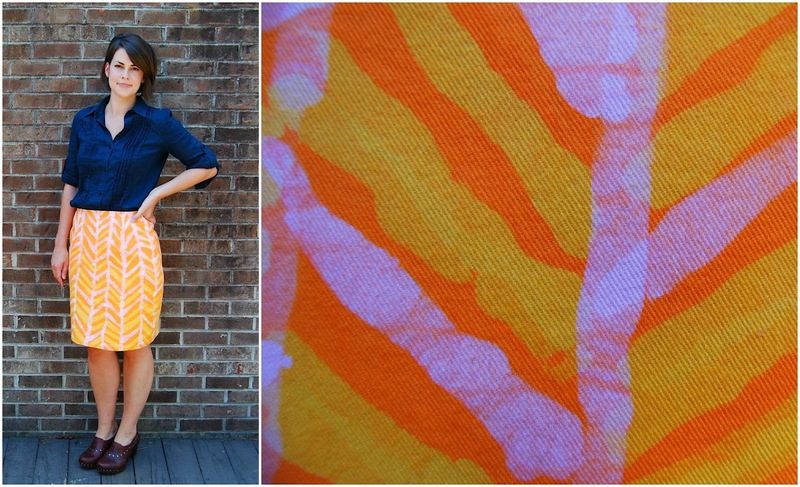 There was some dappled sunlight on the fabric in the photo below and it made the orange look saturated. It's not as bright in real life. The fabric is super soft and supple. No trace of wax at all, unlike the ironed version. I'll definitely be boiling again, but not using any hot water dye. I think it's only fiber reactive dyes for me from now on. I cut my pattern pieces and sewed up my skirt afterwards. What do you think? Can an art teacher get away with wearing a skirt like this? I hope so. Because I'm going to wear it anyway. Now I have one more length of bull denim to use up and one more technique I want to try. 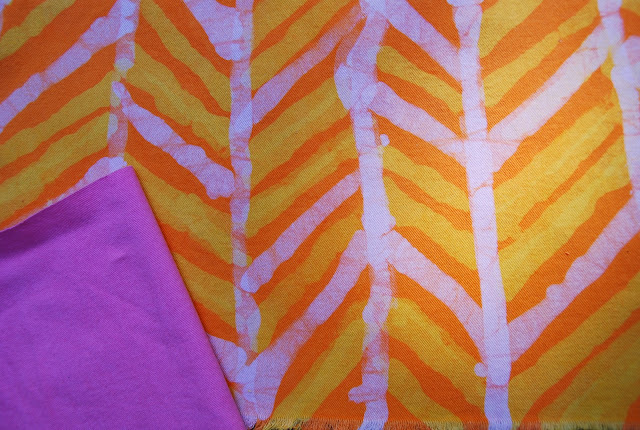 So there may be more batik experiments in the near future! I was planning on doing a big post about my batik adventures this week, but that will have to wait. I don't want to miss out on the shirt dress party. So, you'll notice that my shirt dress looks a tiny bit different than the envelope-- namely a placket that extends all the way down the front. I wish I could say I planned it all along but I didn't. It was a bit of luck that it all worked out in the end and I have a wearable dress because I CUT A SIZE TOO SMALL. Has anyone else ever done that? I apparently was distracted during the prep stage. Well, actually, I normally cut one size when I make tops and things that are loosely fitted and one size up when I make bottoms and dresses, especially dresses with fitted waists. And I cut the smaller of the two sizes. When I say cut I mean I actually cut the pattern tissue. I know all the pattern tracers out there are snickering right now. But I really, really hate tracing patterns. Unless it is something truly special. For a .99 cent pattern I figure it's not a big deal. Um, except for situations like this. Luckily I made a muslin. Thank goodness I made a muslin because I figured out it was too small before I cut my pretty green linen/rayon blend. I've read differing opinions on this pattern running either too big or too small. I've read comments about having way too much ease, but I did not find that was the case at all. In fact, when I read the finished waist measurement on the pattern tissue (after I had cut it out- doh) it listed the ease as only two and half inches. In my experiences with Simplicity patterns so far, this is out of the ordinary. Usually I find that the ease built in to their patterns is somewhere upwards of three or four inches. Anyway. That's a long winded way of saying that this pattern is very fitted through the waist. Again, I can only speak from my limited sewing experiences so take that for what it's worth. Someone more experienced would have probably checked the ease before they cut out the pattern. Or traced it. When I figured out it wasn't going to fit through the waist (I would have been able to wear it, but sitting down would have been uncomfortable) I decided to let out the pleats at the front. The back seemed ok. The shoulders fit nicely. I determined that I could make smaller pleats to add width to the bottom of the bodice, but then I would also have to add some width to the skirt pieces. Then a light bulb went off and I thought about adding a placket down the front of the skirt. That way I could cut the front skirt pieces with a facing and fold whatever was leftover in for the placket. And it worked. And I didn't need to add a zipper because I made the placket totally functional. Can I get a woot woot for no zipper? I did have to add a hook and eye at the waist seam, but it's all very flat and secure. 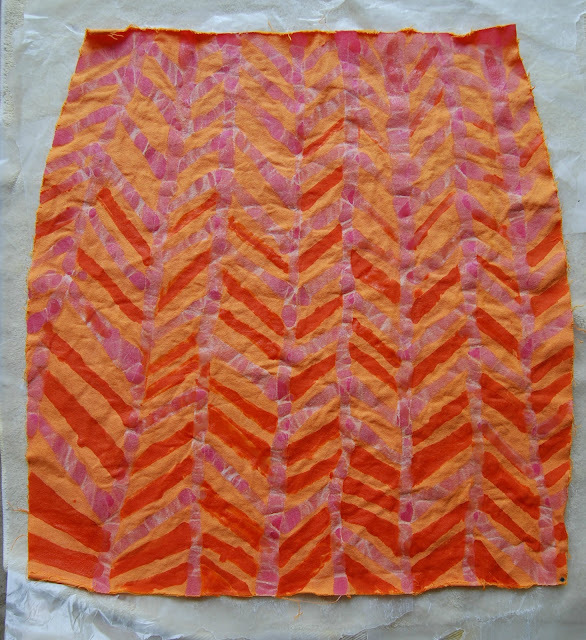 In the end, I scratched the pleats completely and just gathered where the pleats are supposed to be. As a result, I don't have as much blouse-y-ness as the pattern calls for. The jury is still out on whether this is a good thing. I've seen the blouse-y-ness look really good on some. I think my little bit of errant gathering looks a little odd. When I signed up to do Sunni's sew along, my main goal was to fit the back of this dress really well and hopefully find a solution to my back fitting woes. After the initial fiasco of cutting out too small a size, that went out the window. I did make some changes during my muslin stage. I did a square shoulder adjustment and then lowered the back neckline 3/4 " before I even cut out my muslin. That seems to be pretty standard for me. I shortened the back waist length about 1/2". And I slashed and spread the sleeve to add about 3/4" of width for my, erm, bulging biceps. I think the sleeve alteration made the most difference. Look what I can do. Total uninhibited arm movement! Woo hoo! This is necessary for a dress that I plan to wear to work. I bend over, sit, squat, reach, etc. all day long. I decided to make the under collar and back facing blue because I can do that if I want to. That's what I love most about sewing my own clothes. And I used blue thread for the buttonholes and hem. Again, because I can :)- I originally had some blue plastic buttons picked out but I wasn't happy with them. I found these pretty square mother of pearl buttons at the fabric store and I love them. I think they are perfect for this dress. All in all, I really enjoyed the sew along. I love making myself do things differently and learning new techniques. I think it helps me grow and keeps me out of a sewing rut. My favorite tip I learned was about using the back facing to attach the collar. I made a coat that was put together that way and I remember thinking that it was genius then. I got another haircut in case you were wondering. Can you tell I'm feeling pretty sassy in my new dress? Thanks so much, Sunni, for all your hard work. I'm not sure anyone, myself included, realizes how much time and effort goes in to organizing a sew along and putting together all those posts. Just know that it is appreciated! Muchas gracias! This is just a bit of blog housekeeping. Also, you can only type the word blog so many times before it starts to look really odd.... Blog. Bloog. Blogg. I'm trying out Bloglovin'. I've had some issues with reading blogs from my dashboard (the lazy girl way, I know) so I'm trying out an actual reader. I chose this one because you actually click over and see the real layout of the blog. I like seeing posts on the actual blog, you know? Where things are on the page, headers, color choices and layouts... all those things make up the personality of a blog. Anyone else use a reader that you love? I'm not up to date on other options, so I'd love to hear how you read your blog roll. 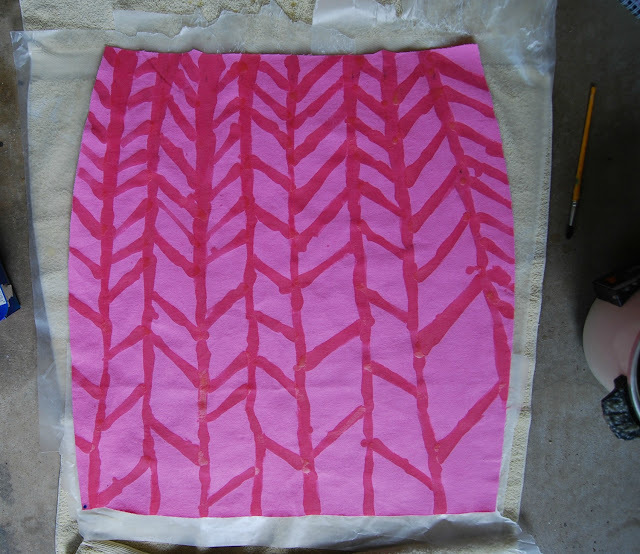 Check out my hand painted batik skirt (!). Ok, so the batik is not a very good one at this point. I had some issues with applying the dye. But boy, oh boy, did I have fun testing it out. I'm currently working on another that is coming along much better and I'm totally psyched. It really feels like I'm combining my two passions in to one on this sort of project: art and sewing. I have done several batiks before as art projects, but I've never done anything where the materials and design had to be apparel appropriate. I've actually taught batik before to my fifth grade art club (It's a small group- I don't bring out the hot wax in a regular classroom). We do a simple version on a giant coffee filter with watercolor as the "dye." So consider this to be an elementary school style batik. Any time I approach an art project I'm always thinking about how I can teach it to kids, so I usually take the simplest approach. Just bear that in mind while you're reading how I did this. I am, most definitely, not an expert. 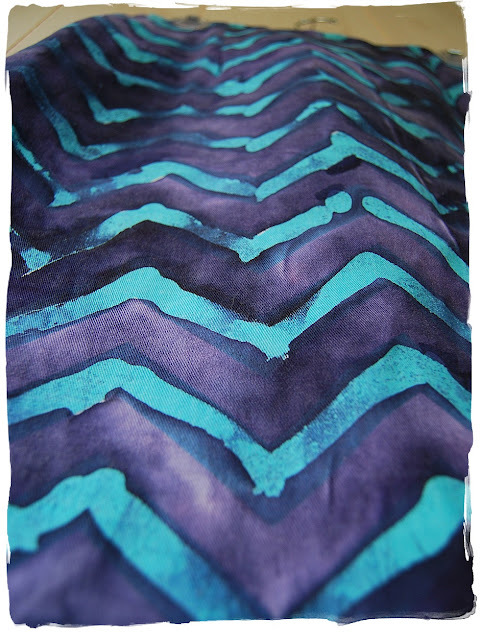 I used a home decor fabric that already had a zig zag stripe. I thought it would be a good practice fabric. I wasn't too worried about messing it up. This is my wax set up. I bought an old rice cooker at a thrift store years ago to melt the wax. I used a mix of beeswax and paraffin, which is generally what you get when you buy a batik wax. The rice cooker is nice because it will heat up and melt your wax and then you can switch it to the 'warm' setting so you don't risk overheating, which can be dangerous. I did the waxing out in the garage because the smell can give me a headache. 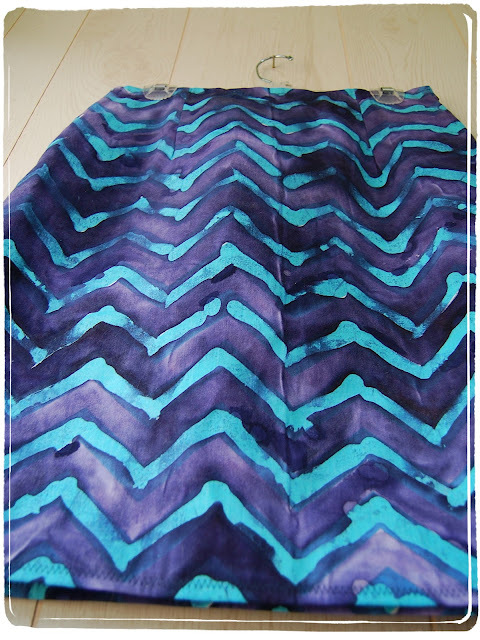 All I did was (very sloppily) paint wax over the blue zig zag stripe. I know there are other tools that give you more precision, but a brush worked fine for what I wanted. I didn't worry about the drips, though later I painted back over them because they stood out too much. I didn't stretch my fabric. I put a layer of wax paper underneath and the fabric peeled off easily when I was done applying the wax. Like I said before, not the proper way to do it but definitely the simplest. After the wax was dry, I painted the fabric with the same fabric paints I used to do my painted jacket, Jacquard Dye-na-flow paints. The main reason I used these is because I already had them. I don't think they are ideal for something like this. It pretty much took the whole bottle to cover the two pieces. I painted everything midnight blue. I could see using Dye-na-flow paints for a batik if you planned to use a lot of different colors and wanted more control over what went where. In hindsight, I really just wanted a solid color which is how I am working now. After the paint was dry I removed the wax with an old iron and lots of newsprint. 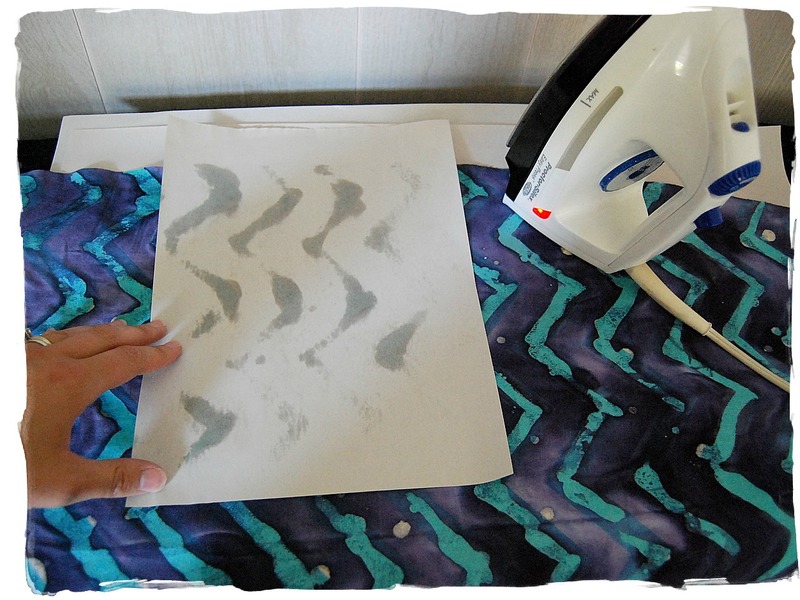 The ironing served two purposes; removing the wax and setting the fabric paint. I covered my ironing board with a heavy piece of denim and several layers of newsprint. Then I used smaller pieces of newsprint on top of the fabric. Note that I did not using my nice iron. I'm using an old one, which I luckily saved. You do get some wax on your iron when you do this. I worked in small sections until the newsprint was clean. Removing the wax was my favorite part. 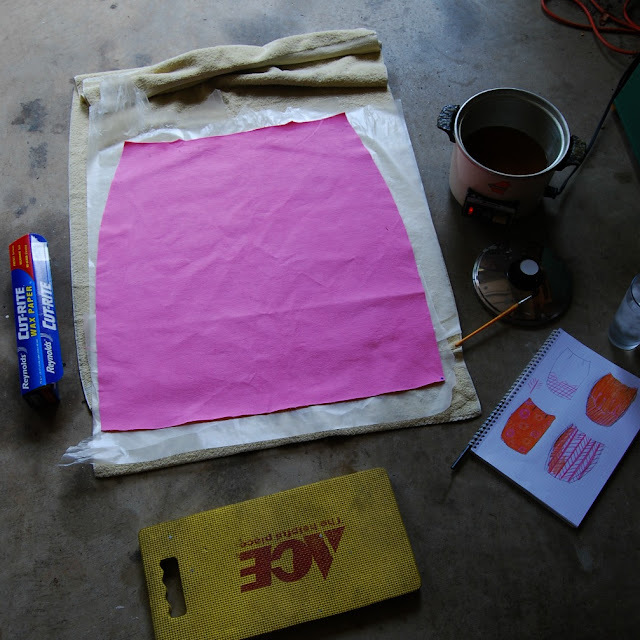 It was neat to see the resist-dyed design take shape as the wax was removed. Afterwards I washed the fabric in hot water and sewed up my skirt. I used my straight skirt pattern I mentioned in my last post. Nothing extraordinary about the pattern. I underlined it with a broadcloth. 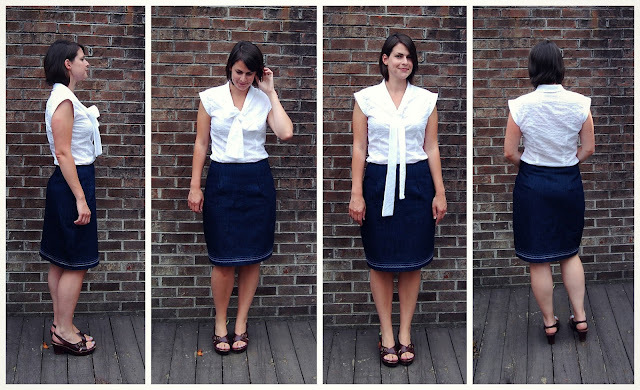 That's probably my favorite thing to do to a simple cotton skirt. It makes it feel so much more substantial. 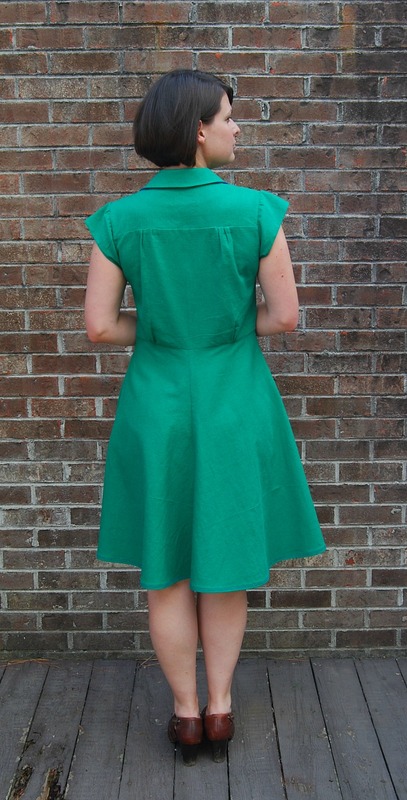 I used a grosgrain ribbon as a waist facing and finished the hem with a zig zag stitch, of course. It's not a skirt I'll wear to anything other than bumming around, but I like it. I do wish I had ironed out the center crease before I started. The dye settled in the crease and left a line. And that's it. Fun stuff! I felt like I actually had an art project going on at home. I'm working on another batik skirt, but I ordered some cold water dyes so I could do a solid dye instead of painting it on. It's so much fun. And of course I'm being a good blogger and taking lots of pictures along the way. Anyone else tried batik before? I've got to be careful or my laundry room will be turned in to a dye studio before I know it. Yep, I made some work appropriate separates. And here I am wearing them together. But I'm kinda meh about the whole shebang. Maybe you can help me figure out a solution. I've got a few issues I'd like to fix. I'm on a mission to make some work appropriate things because I got a new job! I'm still teaching art but I'll be at a new school next year. I went from traveling between two schools to now being full time at one school, so I am super excited about that. I don't have to cart all my junk around with me anymore. First, the blouse. I won a giveaway from Forrest over at Presser Foot Propaganda and she sent me this lovely 80's bow blouse pattern (thank you!). 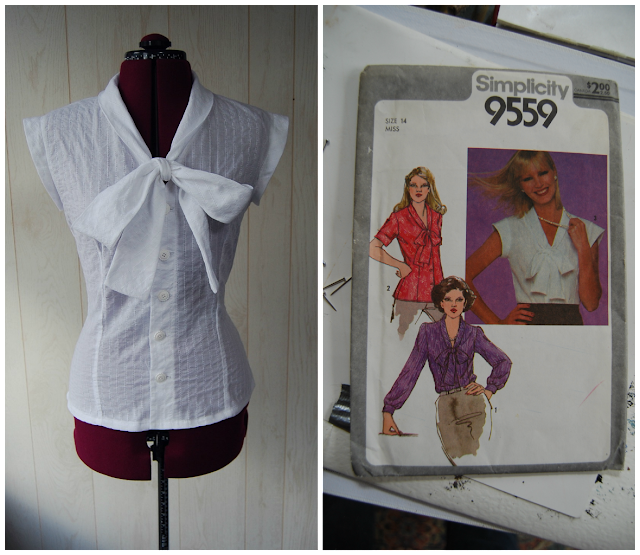 I've never made nor worn a bow blouse before. I'm super late on this trend, but I thought I'd give it a try anyway. 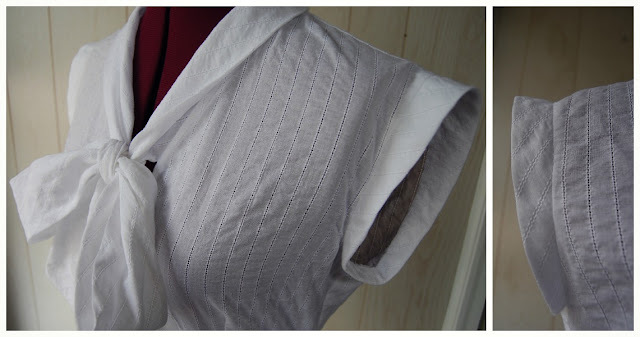 I used a really pretty white cotton shirting that has an open stripe throughout. I love the fabric. But I didn't take in to account the sheerness. I sewed up the darts as recommended on the pattern. They were really deep darts. They had you cut the darts open and press flat, making a little notch at the waist. Well, I did that and you could see the ugly seam allowances through the fabric along with the notch. It looked sloppy. So I trimmed the dart allowances down to almost nothing and used my overlock stitch to keep the edges neat. Am I calling this stitch the right thing- an overlock stitch? Just curious. I was really happy with the way it helped tidy up the raw edge. I used it a few more times to overlock raw edges where I couldn't use french seams. I used it on the inside of my dip dyed dress, too. The sleeves were insane. I used the fun little cap sleeve, which is what initially drew me to the pattern in the first place. But they were huuuuuuge. They stuck out so far I looked like I belonged in an episode of the Jetsons. I did the lazy girl's fix and folded them to the inside and slip stitched the folded edge to the armscye seam allowance. It cut the width in half. I'm happy with the blouse but I just don't think I've figured out how to wear it. I don't like it with this skirt. I think I'll have to wear it in a more casual way. Maybe with jeans. Any thoughts? I feel like my short hair cut makes it too sweet, if you know what I mean. The skirt I'm happier with, except for those funny bubbles at the ends of the front darts. 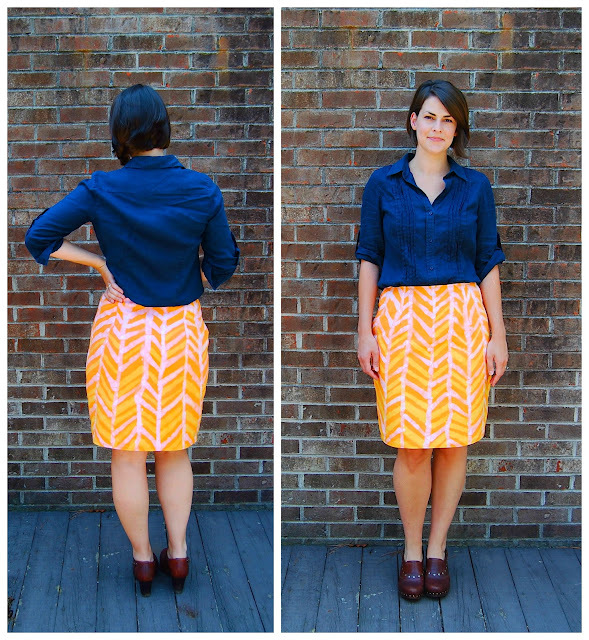 I drafted this skirt based on my a-line skirt block from last summer. I took my measurements again, and sadly, they are exactly the same. I say 'sadly' because I just finished a twelve week "couch to 5k" running club. I was hoping for a tiny reduction in booty. Oh well. I'm not calling it a pencil skirt. I'm calling this a straight skirt. Instead of having a wider sweep at the hem I made the hem the exact same width as the widest part of the hip. To me, pencil skirts are narrower at the hem. I wanted something simple that wouldn't require any sort of slit. This is the perfect style of skirt to wear to work when I want to feel a little more "grown up." Mostly I can get away with corduroys and knit tops. But every once in a while I need to wear something a little more professional, especially since I'll be in a new work environment. I made this particular skirt in denim because it was really just a practice version. I have another version in the works. But the denim was too boring to not have some sort of fun feature. I used one of those fancy embroidery stitches on my machine and made a border at the hem. I changed thread and width with each row. Would it be too kitschy if I put a little orange fish in there? It reminds me of waves. I'm happy with the skirt except for the front darts. I fiddled around with them quite a bit but couldn't get the bubbles to disappear. The denim is really heavy. I think that may have something to do with it. And there are also some wrinkles on the back waist. Any idea what they could be from? And there it is. They are both good pieces, but not great. I think with a few tweaks I could make that straight skirt pattern perfect. And the blouse just needs a better pairing. Another baby gift down. Why is it so much fun to make baby clothes? I think it's just because of the size. So tiny. So gratifying because it takes less time to finish something. And you can use ric rac to your heart's content. I made another bath robe from the pattern I drafted using Winifred Aldrich's Metric Pattern Cutting for Children's Wear. 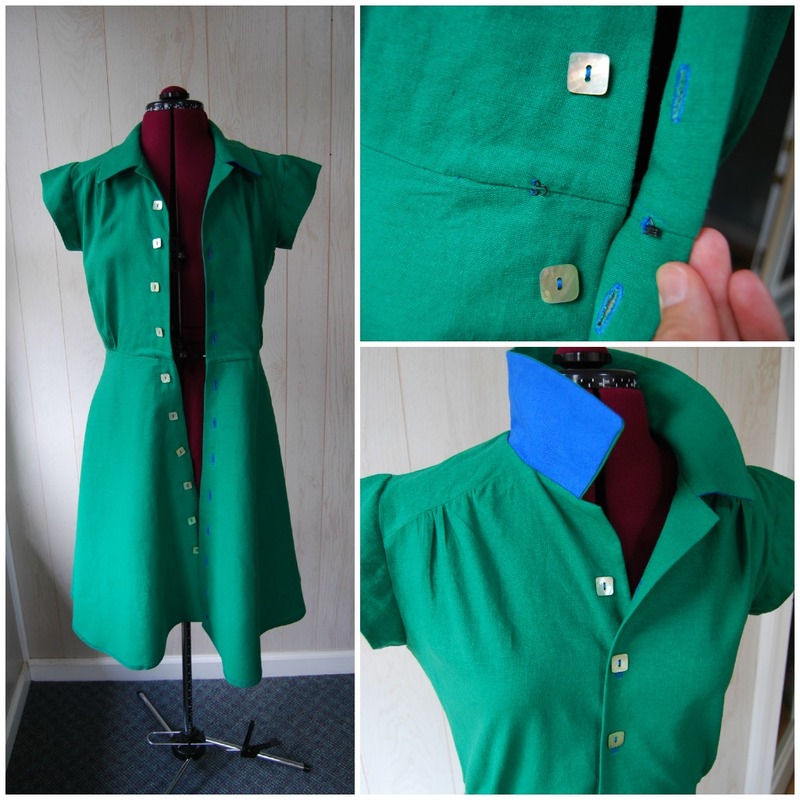 And I also made a little popover dress, a free pattern from Oliver and S. Just because. I love that pattern. I used my shrunken down copy again. I'm guessing it will fit by the end of the summer, which is fine because it will be hot until October here. The bathrobe is a bit larger. But perfect to put a little bundle in after a bath. The inside is that insanely soft minky business. Both are fit for a little princess which just also happened to be the recipient of this gift.